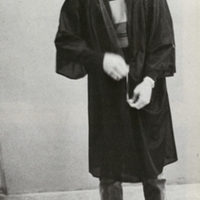 Oviedo High School senior, Mike Pinard, dressing for graduation in 1986. Oviedo High School is a Seminole County Public School located in Oviedo, Florida. Originally called the Oviedo School, the institution was first established in 1932 as a K-12 school. In 1948, the secondary grades separated from the elementary school. The upper grade levels formed Oviedo High School and moved to the campus at 601 King Street. Oviedo High School is notable for The Lion's Tale, the award-winning school newspaper recognized by various national and state scholastic press associations; its high ratings from the Governor's A+ Plan for Education; and its successful athletics programs. Original black and white photograph, 1986. 3.25 x 5.75 inch print reproduction of original black and white photograph by Oviedian Staff of 1986, 1986: Oviedian 1986, (Oviedo, FL: Oviedo High School, 1986): Seminole County Public Schools Collection, UCF Public History Center, Sanford, Florida. Digital reproduction of 3.25 x 5.75 inch print reproduction of original black and white photograph by Oviedian Staff of 1986. 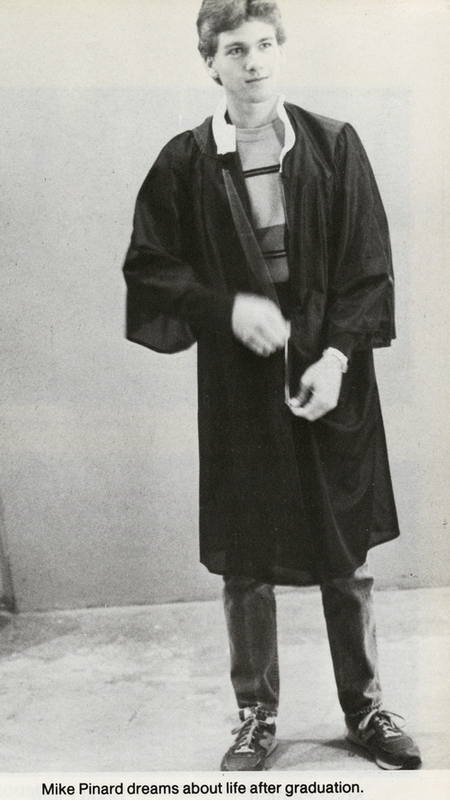 Mike Pinard dreams about life after graduation. Oviedian Staff of 1986. “Oviedo High School Graduating Senior Mike Pinard.” RICHES of Central Florida accessed April 25, 2019, https://richesmi.cah.ucf.edu/omeka/items/show/2812.